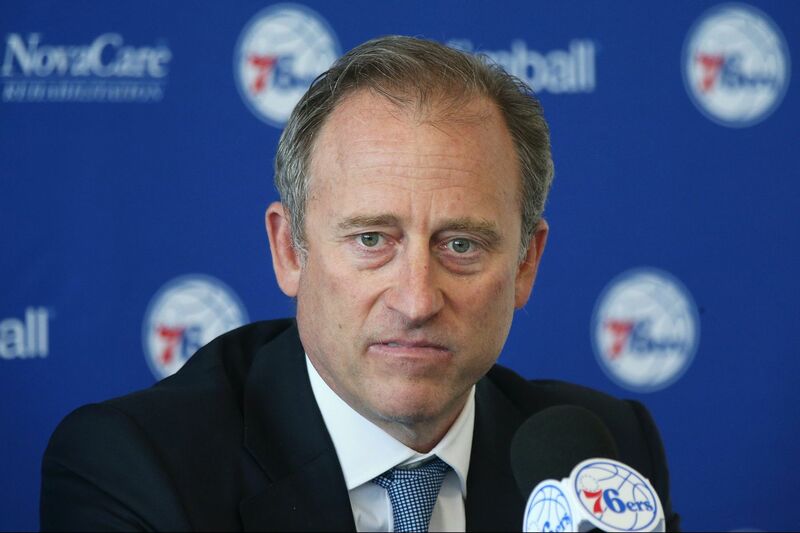 Josh Harris and the other Sixers owners still haven't hired a general manager. The 76ers announced Monday that they had promoted four members of their front office, though it was a challenge to see what, aside from the executives' titles, had actually changed. Marc Eversley, for instance, who had been the Sixers' vice president of player personnel, is now the team's senior vice president of player personnel. But the news release didn't mention that the Sixers had hired anyone for or elevated anyone into Eversley's old job, so one has to wonder: Eversley is senior to … whom, exactly? Similarly, Alex Rucker went from vice president of analytics and strategy to senior vice president of analytics and strategy, with no apparent successor to help him with all those algorithms and spreadsheets. Elton Brand — the general manager of the Sixers' G League team, the Delaware Blue Coats — did take on the title of vice president of basketball operations, and he "will contribute extensively to all areas of the 76ers' basketball operations department," according to the news release. But then, given that Brand was sitting in on predraft workouts and sometimes speaking on behalf of the franchise to the media after those workouts, it's hard to see how he wasn't already contributing extensively. One move of the bunch, though, stood out as particularly interesting. Ned Cohen became the Sixers' assistant general manager, having served previously as their vice president of basketball operations (Brand's new gig) and their chief of staff. What made this change so interesting, of course, was that the Sixers don't have a full-time, long-term general manager. Brett Brown is still the interim GM, and he was, by all appearances, the organization's point man on draft night. But there has been no indication that he will remain in that role beyond this season — a time line that owner Josh Harris confirmed to ESPN on Monday. "He's reflective on just how much harder it would be to try and do both jobs," Harris said. "He's done it on a temporary basis because it's the right thing for the organization. His goal is to coach the Sixers to an NBA championship, and in order to put us in that position, to have a maximum chance of doing that, Brett realizes that a strengthened front office would be a good thing." 76ers head coach and interim general manager Brett Brown. Earlier this summer, after Bryan Colangelo's tenure ended over that strange Twitter scandal, the Sixers were linked publicly to three well-known, accomplished GMs: Daryl Morey, R.C. Buford, and Sam Presti. None of those three was ever coming here, but it sure did look good for the Sixers to be mentioned in headlines with them. Harris has since kept up that drumbeat, telling ESPN that he and the franchise's other owners aren't (in the breakthrough term of the offseason) "star-hunting" just for great players, but also for a great GM, even one without experience in the position. "We need someone to add real value," Harris said, "which includes looking at young up-and-coming basketball executives and non-traditional candidates. We're going to have a pretty selective list." With Joel Embiid and Ben Simmons and a team that won 52 games last season, the Sixers' GM job would seem attractive, and in Harris' rosy scenario, Brown can hold the fort while the Sixers take a year to survey the landscape of candidates and find the most qualified and dynamic one. There's just one problem: The scenario doesn't make sense. Once those burner accounts caused Colangelo's viability as a GM to go up in flames, there was nothing stopping the Sixers from canvassing the NBA for those "young up-and-coming basketball executives and non-traditional candidates" whom Harris now wants to find. Instead, they chose to fortify their existing front-office infrastructure and keep Brown in a position that everyone knows he won't retain for long. That means the new GM will have to collaborate with the executives in whom the Sixers just reaffirmed their faith and trust. That means the new GM won't have the freedom and power to shape the player-personnel department as he or she sees fit. That makes the job less attractive than one might first think it is. More, unless Harris and the other owners presume that the Sixers will take a step backward this season, there's no need for any GM search at all. If the Sixers continue improving, if they win more than 52 games and advance beyond the postseason's second round, it will only reaffirm the competence of Cohen, Eversley, et al, and ownership could easily promote one of them. But if the Sixers regress, they will have to hire a new GM, only they will have wasted a season because they waited too long to start looking in earnest. The likely solution – not necessarily the best one, but the likely one – is that the Sixers eventually will hire someone who will function much as Brown already does: as a franchise spokesman, as a partner with and ally to the basketball operations department. The job will come with a cool title, General Manager of the Philadelphia 76ers, and maybe a corner office with a view, but not much else. As far as the Sixers are concerned, everyone is pretty much in his right place already.